It might be a good idea to update this by stating that Demos will not be accepted, Quest versions need to be set to 0 (custom quest) in the header, and that a Custom Quest is something that you created, not a quest that someone else created and you altered in some minuscule way and are passing it off as your own. Where does it say where to host quests , how to do screenshots and links and stuff for setting up a quest thread. You have to get an image host like www.photobucket.com and a file hosting service like that offered by Geocities. you may have to wait a few days to get your quest aproved by mods if you have less than 10 posts as you have to have it checked . You are getting making a thread on the forums confused with submitting a completed quest to the database. You don't need to even be active on the forums (technically) to submit a quest, but it is preferred so that if there are any problems we can contact the quest maker but then people can ask questions about the quest once the submission has been processed and people begin playing it. If I ever feel like updating my submission (like, after some minor bugfixes), can I do so and in what way? There's no any "update" checkbox like at PZC, just the usual "new submission" form. The easiest way is to contact someone who is a QDB manager (such as myself) by PM and we can do the update if you provide a link to the file and the information you need updated. PureZC has a type of submission process that lets you replace a submission with an updated file if you so desire. You'll pass a page with your submitted content on it, and some checkboxes ("No update!" means you want to submit something new). It seems people cannot read. Amazing isn't it? 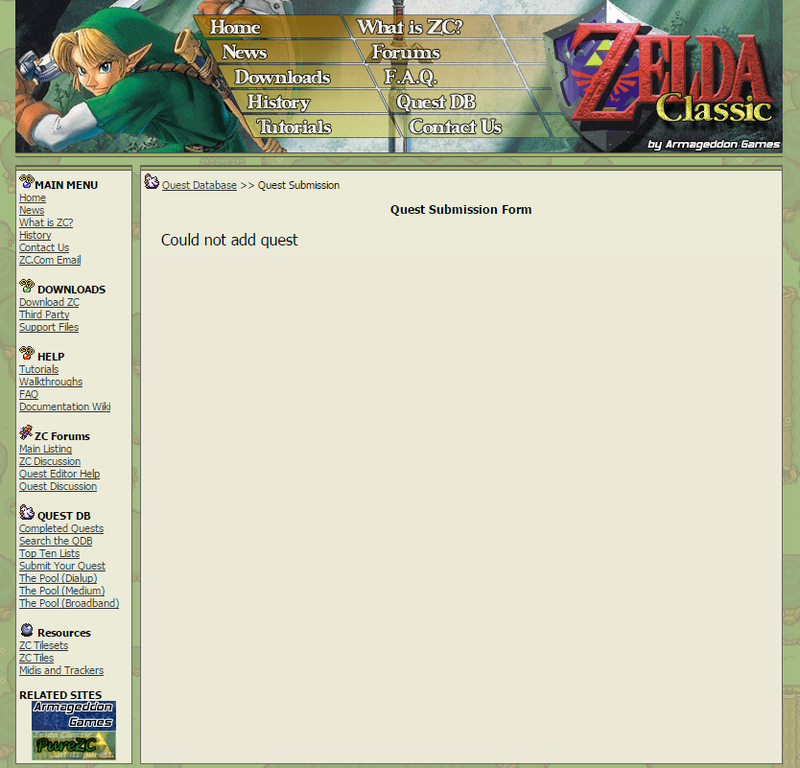 I've created an official term for quests which fail to follow the rule regarding file hosting: Pagelink. If you see the site update with new quests, and yours isn't on there because you hosted it this way, I'm sorry: I cannot offer you free advice. what gives? I'm getting annoyed cause I've followed the guidelines to the t. Is there a character limit in any of the fields? Is there a size limit I'm not aware of? What's going on?